SBR stands for Styrene Budadine Rubber. It is manufactured as a liquid and poured into molds, generally for the automotive industry. We utilize recycled SBR from tires, hoses and windshield wipers. SBR is utilized in the Base Mat of the Vitriturf Playground System. We offer it as shreds rather than as granules. The shreds make the system more resilient. EPDM stands for Ethyl Propolyne Dione Monomer. It is manufactured as a liquid and then oven dried in sheet form. The sheets for our industry are typically 18” wide by 3′ long. Because it is produced as a liquid, it may be tinted to certain colors. Some pigments hold up well under the Ultra Violet, but others do not such as primary red. The slabs are then granulated to the desired size. The size can vary from .5 mm to 4mm. We utilize .5 to 3mm. The EPDM is utilized in our wearing course. We only use virgin EPDM rather than recycled EPDM. The recycled EPDM looses it characteristics and deteriorates much more rapidly. What is the difference between Binder and Aliphatic Binder? The standard Binder is what the industry calls an aromatic binder. This is the binder most of our competitors use for both their base mat and wearing course. Aromatic binders are good, but they do not offer much Ultra Violet protection. Aromatic binders amber, so when they are mixed with certain colors such as grey, tan, purple and eggshell they cast a yellow appearance. It is fine to utilize aromatic binders in the base mat and colors that will not exhibit much ambering such as red, black and green. Because aromatic binders do not offer much ultraviolet protection they chalk over time and eventually break down. Once they breakdown they do not hold the granules together and the system will fail. Aliphatic binders will provide what the aromatic binder cannot. Aliphatic binders are ultraviolet resistant so the granules remain color fast. Because the aliphatic binder is ultra violet resistant it will not breakdown as fast and will offer a longer life to the system. Because of our introduction of the aliphatic binder to the poured in place industry, this binder is now being specified throughout the United States as the preferred binder. 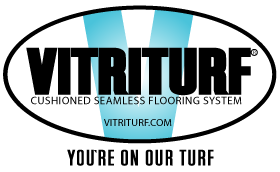 In what temperatures may the Vitriturf System be applied? Temperature affects the system in workability of the materials and the dry time. We prefer to install the system in temperatures above 40 F. The lower the temperature, the thicker the viscosity of the binder, the harder it is to trowel and longer to dry. The dry time of the binder is dependent on two variables: temperature and humidity. The higher the temperature and humidity the faster it will dry. If you have high temperatures but low humidity, the material will not dry as fast. This is because the urethane is moisture cured. When can we use the playground after the system is installed? In most cases the playground can be opened 24 hours after the installation of the system. We prefer 48 hours for sufficient curing of the material. One must consider the time of year and the temperature and humidity before allowing usage of the play area. Vitriturf is not “toxic.” Our urethanes are properly labeled for warnings. There is no smell associated with our product and they are 100% solids that means there is no solvent in the product. The only smells emitted during a project would be a rubber smell or diesel fuel. The diesel fuel is utilized as a lubricant for troweling and cleaning of the mixer. How is the system terminated? The edge of the Vitriturf System should not be left exposed. In situations where an existing edge does not exist a “keyway” should be provided at the termination point. A “keyway” is a saw cut trench with dimensions of 1/2” wide by 1/2” deep.